In honor of the day to recognize our Dads, we’re doing just that — with a look at how they influenced each of us and our love of baseball. Most fathers and daughters have that one thing they can always talk about. Sports is that for my Dad and I. Specifically baseball. My first love has always been baseball. For that, I have my Dad to thank! Whether it was being in Florida during the 1982 World Series (I was about 3, so the only vivid memories come from photos), sitting next to him when Adam Wainwright got the final out of the 2006 World Series or last October when I got home from class after a presentation in which I had to dress up that night, we have shared these moments together. I was home just in time to catch what I thought was the last few innings of Game 6 of the World Series, disappointed and thinking it was all but over and then him laughing and getting a little choked up as I screamed and ran around in dress pants and heels after David Freese hit that beautiful walk-off home run. My fondest memories of my father involve baseball. Going to the one of the local drive-in restaurants on a night when the Cardinals were on the radio, he and I would get ice cream, sit in the car and listen to the outside noises while Jack Buck and Mike Shannon told us about the game. My first game to Busch II when I was 8 and got to see my favorite pitcher, John Tudor … throw for the Dodgers. Getting to see some awful games during the early 1990s … making sure to go when the San Francisco Giants were playing because I was so frustrated with the Cards, I thought I needed a new team. Getting to see the teams of the late 1990s and early 2000s. Seeing Matt Morris pitch. Seeing Mark McGwire and Sammy Sosa during the home run chase. Going to St. Louis one week before Will Clark was traded to the Cardinals and seeing Dad scramble to get tickets so I could see one of my favorites in a Cardinals uniform. He wasn’t successful but I certainly appreciated the effort. Some of you know that two years ago, my father underwent double bypass surgery. What was I able to talk to him about while he was fighting to get out of the anesthesia? Yes, baseball. We’ve gotten into going to Memphis to see the Redbirds, the Cardinals AAA affiliate, play at AutoZone Park. Memphis is where my father grew up. The Cardinals are his favorite team. It’s a good fit! We’ve gotten to see some great games and a lot of future major leaguers. And a lot of players who were entertaining but never quite made it BIG … Yes, I’m talking Bo Hart and Stubby Clapp! On this Father’s Day, I plan to watch the Cardinals and the Royals with him. It’ll be on the couch. But, it’s still baseball with my Dad. Nothing better. Growing up with a sports fanatic of a dad is fun. You learn a lot, spend quality time together and develop strong connections based on fun team loyalty. Obviously, 2006 was special, as it was the first World Series I had seen. Of course, I watched with my dad. I’ll never forget the pacing, the hyperventilating, the screaming, the high-fiving … all while forgetting that the rest of the family was asleep! As special as that was, though, 2011 was even better. No, not just because of the magic that happened to lead to the title, although that didn’t hurt! It was the moments throughout the season. It was the debates about the bullpen, Tony La Russa and much ado about Albert. We didn’t always agree, mind you, but I loved each debate. Then there were the nights during the playoffs that I had to work, so Dad texted me play-by-play updates, good or bad. The nights he had meetings, so I returned the favor. Watching Game 6 together was exhausting. See, we handle intense game situations very differently. He shuts down, I amp up! You can imagine the mood swings in the room that night! I was standing a few feet from the TV, he was sitting silently on the couch, reminding me to breathe! But the celebration after the now oh-so-famous Mr. Freese bomb was just as classic as the 2006 celebration. High-fives, cheers, hugs … maybe even a few tears! We love our team. Our team. Baseball is our thing. It’s probably our greatest bond. It’s an obsession he created, and now he understands when others don’t. it’s just … our thing. 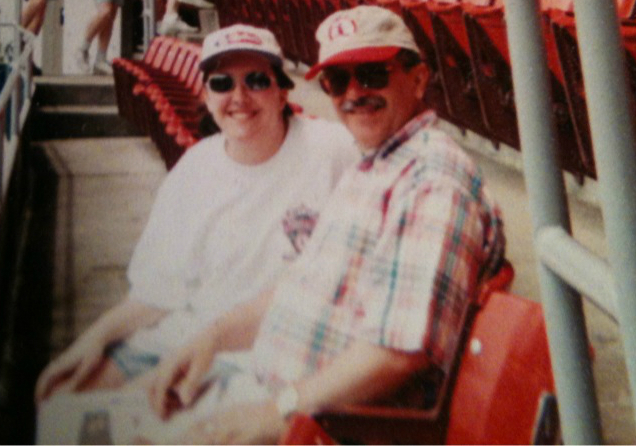 This weekend was the first time I experienced a Cardinals game without him. Instead, I took my newly converted-fan best friend, which was also great fun. But you better believe Dad was getting all the updates as quickly as the cell service in Busch would allow! And don’t worry, Dad. Baseball will always be our thing! My Dad was not a Cardinals fan, but neither was I growing up. In fact, it was Little League baseball — my Dad coaching my brother — that was what I loved for years. And it was my Dad who taught me about the game, down to the intricacies of how to keep score. I did that for his teams and, in the process, developed a love for the game that obviously continues. Dad was not a Cubs fan either, but I was in my younger (and foolish) days. I’ve mentioned before that I had an internship in the Cubs media relations department during my senior year of college. The fall before, when I was called for an interview, I needed a way to get the 60 miles from DeKalb,Ill., to Chicago. (This was 20-plus years ago — neither I nor any of my friends had cars at school then. Yes, I know, impossible to believe now.) To the rescue? My Dad. He took the day off work, drove to DeKalb, drove me to Chicago, and then reversed the drive after my interview. It would not be inaccurate to say he hated the Cubs. I have a picture of him somewhere from a game our entire family went to in August 1984. The Cubs won that day and went into first place to stay for the rest of that season. As the Cubs took the lead later in the game, everyone in Wrigley Field was standing and clapping and going crazy … except my Dad. He was seated, calmly marking the play in his scorecard. I understand that reaction more now that I did then. Dad was a Yankees fan during his own college and young adult days, back in the days of Mantle and Maris and Whitey Ford and those World Series championships. Although he saw the team when they were in Chicago playing the White Sox, he didn’t ever make it to Yankee Stadium. When I did, during the old stadium’s final year in 2008, I took plenty of pictures to show him when I got home — even a picture of a picture of the ’61 team that was hanging above an entrance to a concourse. And my aunt (my Dad’s sister) and I made sure to get a picture at Mickey Mantle’s plaque in Monument Park for him. I bought him a Yankees t-shirt on that trip, from a store across the Stadium, and a Hall of Fame t-shirt when our trip moved north to Cooperstown. Plus I took plenty more pictures at the Hall of Fame, since of course there was much to see from those 1960s-era Yankees. Dad would have loved the Hall of Fame, and Yankee Stadium too, but he never had the chance to visit. He actually didn’t leave the house all that much during the last couple years of his life, since a 30-plus year battle with multiple sclerosis made it difficult for him to get around. He spent most of his time in his brown leather Lazy-Boy, watching sports — Notre Dame football in particular but any college football game, college basketball, the Fox or ESPN baseball games of the week. He died on March 12, 2009, right before one of his favorite things to watch on TV: the NCAA basketball tournament. There’s one sporting event in particular I remember him watching religiously year after year, once it started being televised: the Little League World Series. The basic game he taught me about, the game he coached, the game I grew to love, and he still enjoyed it after all those years.